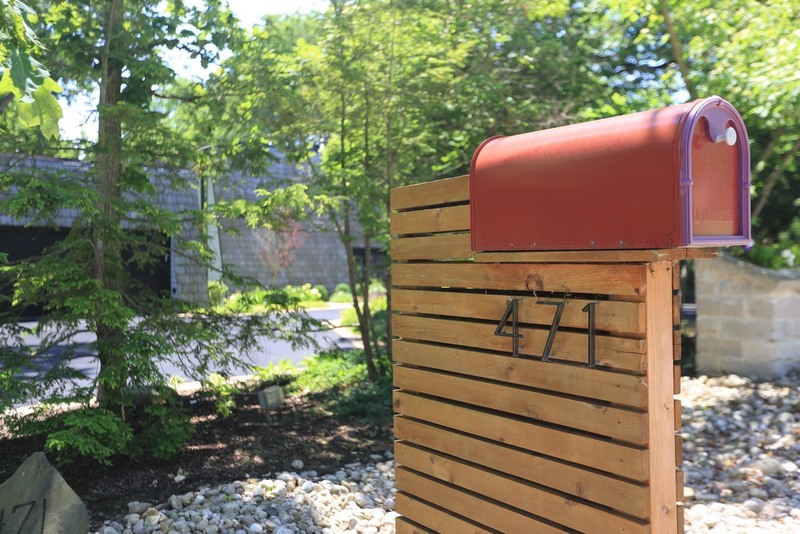 Harry and Jim may not be the first owners of 471 East Oxford Road in North Barrington, but they have possibly enjoyed it more than any previous residents. 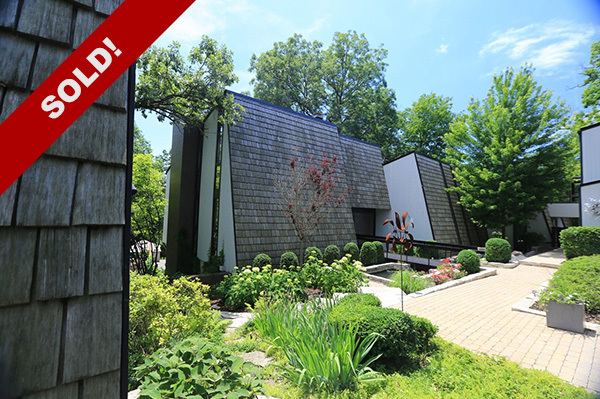 Designed by Frank Lloyd Wright protégé Dennis Blair and built in 1966 for photographer Sandra Ullmann and her husband, the house is sited on a double lot of nearly 2 acres. 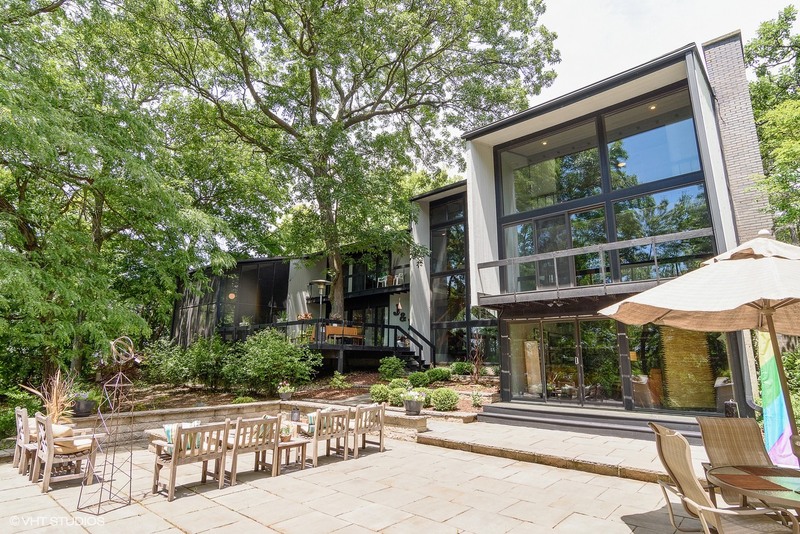 The home features stunning, unique architecture offering privacy from the street, and maximizing the amount of nature to be enjoyed while indoors, blurring the lines between inside and out, as is typical of the best examples of modern architecture. 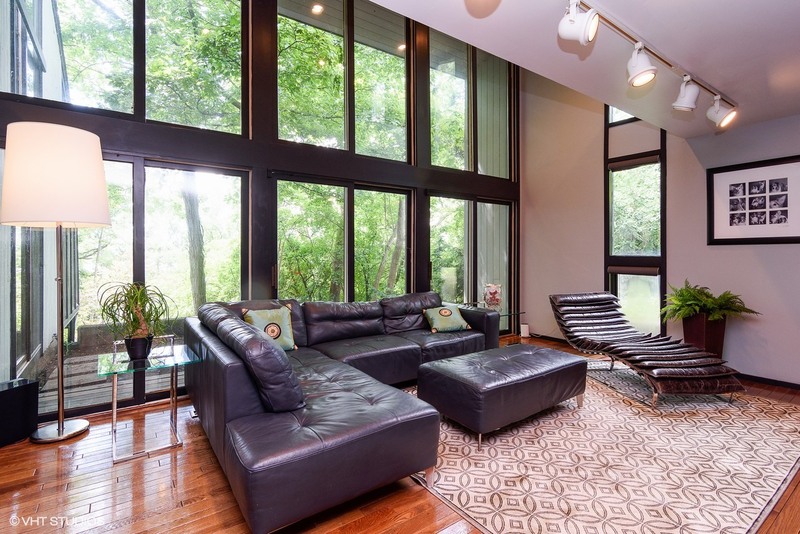 As far as home siting goes, especially for a beautiful modern house taking advantage of passive solar, you couldn’t really do much better than to face south out over Honey Lake. 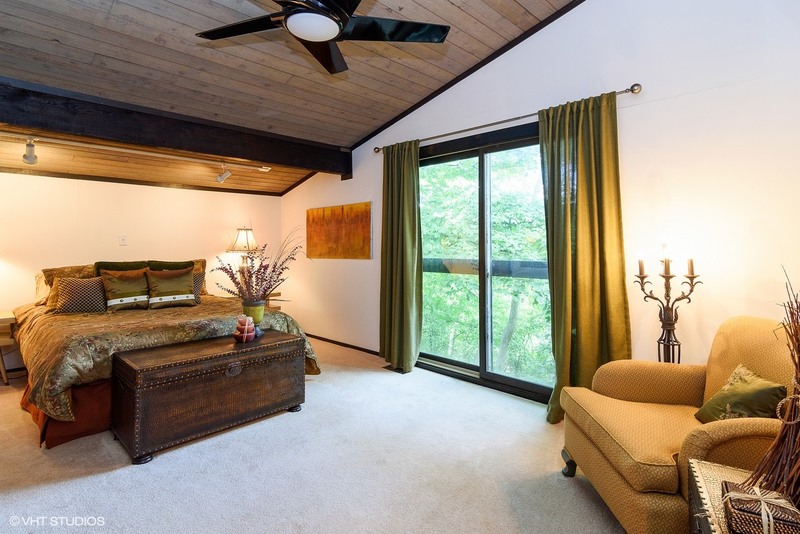 The land slopes gently away from the house toward the lake, offering tremendous views year-round, not only of Honey Lake, but of all the natural beauty on and surrounding the property. 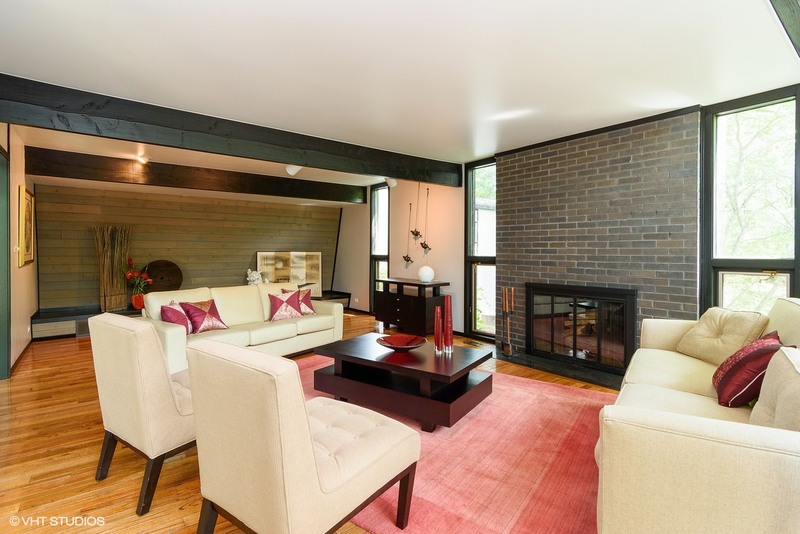 Indeed, the home’s architecture is uncommon, even for modern homes in the Chicago area. The front of the house features walls that are angled out toward the ground. 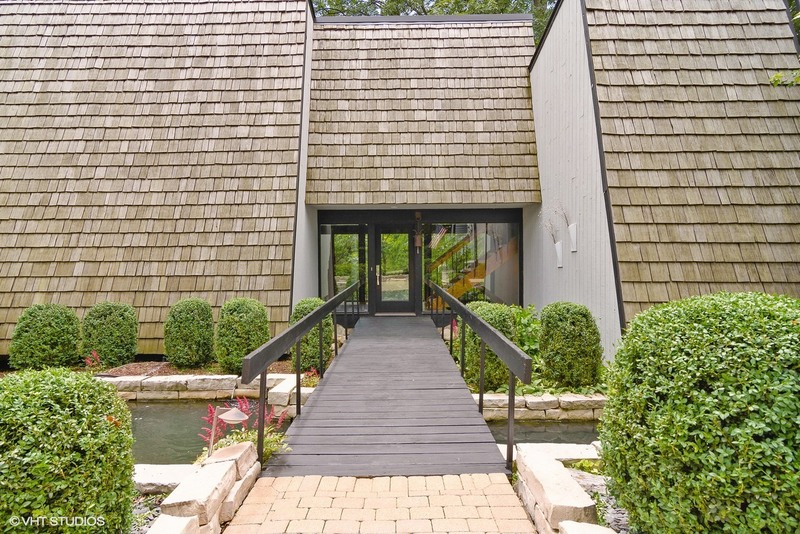 The roofline then angles down from the top, so that the relationship between the front walls and the roof is nearly 90 degrees – but everything is pitched, so the roof sections are sheathed with normal shingles. 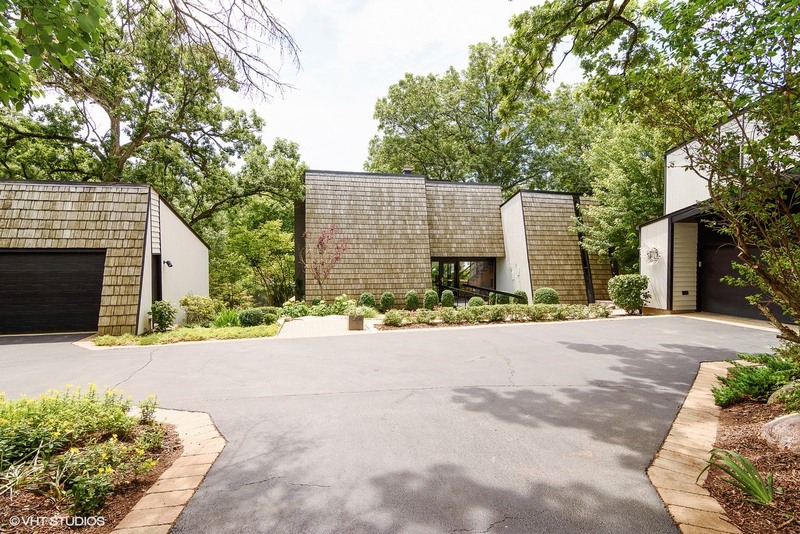 Listed as having just over 4,600sf, the home feels even larger still, thanks to Dennis Blair’s clever architecture that makes such efficient use of space. Plus, many of the rooms feel larger than they are due to the angles of the front walls and rooflines, which carry over into the upper volumes. 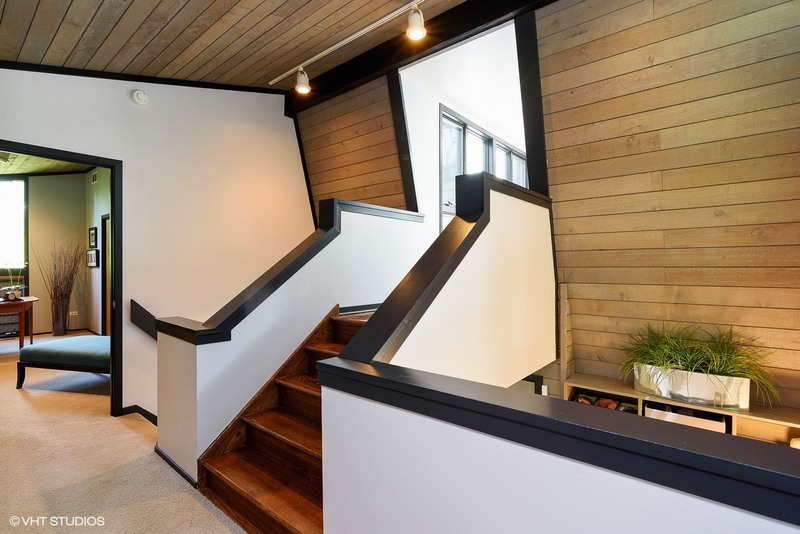 Using a loft-style arrangement of vertical spaces, and bridges that connect different areas also makes the house feel open and airy, eliminating the dark, narrow hallways found in so many homes. So they began to make improvements to the house and the property. “The driveway was gravel, which looked ok, but we didn’t want to deal with a gravel driveway in the winter. We paved the driveway so that it could be plowed or cleared with snow blowers,” says Harry. 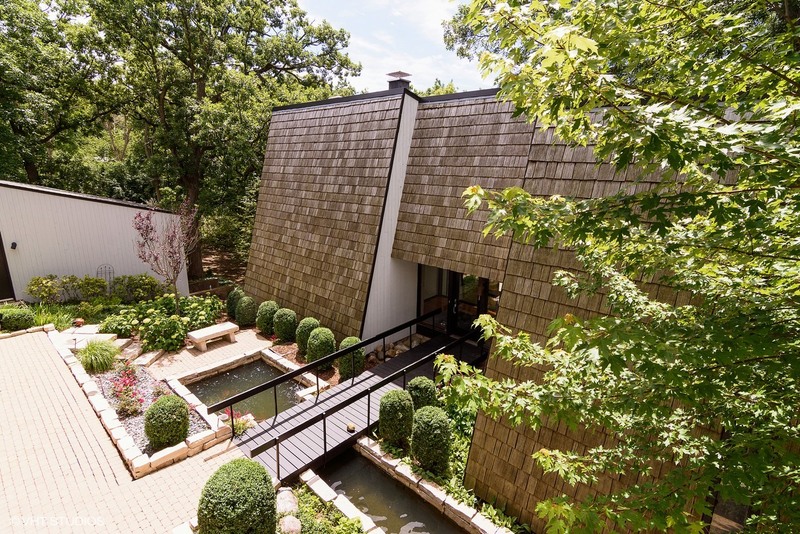 Now when you approach the home, you still cross the same bridge, but you pass over a koi pond crafted from stone with a waterfall at the west end. 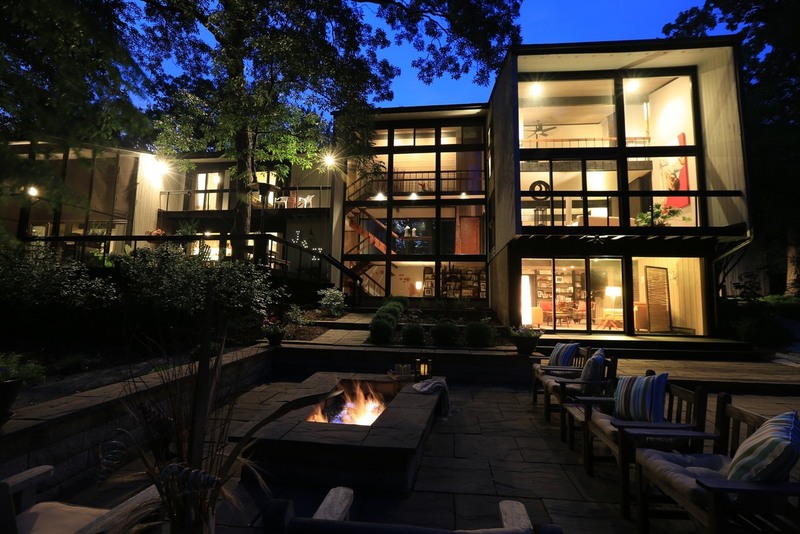 It’s a beautiful, welcoming addition that further emphasizes how special this home is. Inside, the kitchen was set to receive the biggest overhaul. 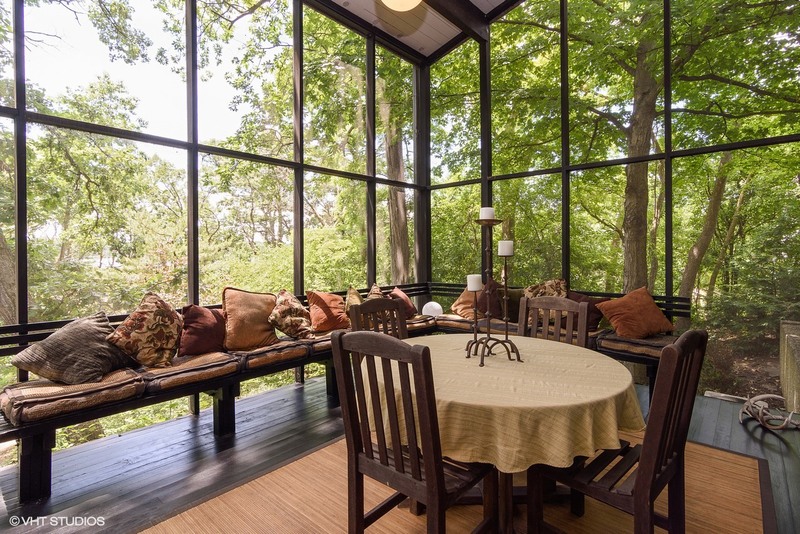 The small, galley kitchen that Harry mentioned had a TV-watching area between it and the screened-in porch. 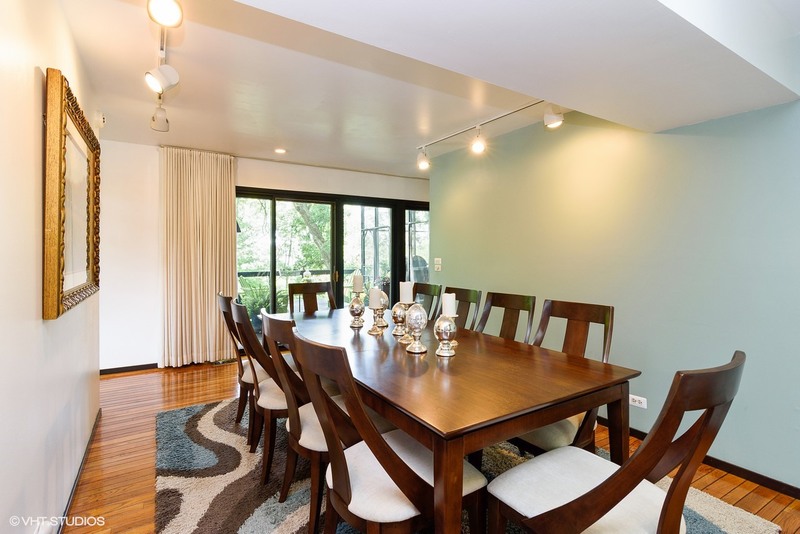 With both a family room and a recreation room already in the house, Harry and Jim felt another TV space wasn’t needed, and knew just how to combine and re-purpose the kitchen and TV room to vastly improve the flow and usefulness of those areas. 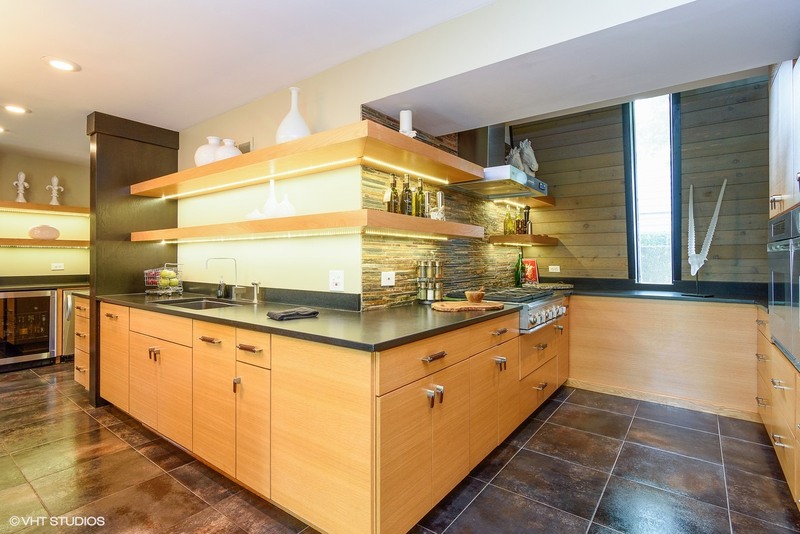 The back portion of the kitchen has plenty of cabinet and counter space, with acid-washed granite topping the cabinets that go along the wall back into the old galley kitchen area. At the far back of the kitchen, the original front wall of the home, with it’s tall, narrow windows, is still there and still features the same cedar cladding as exists throughout the rest of the house. 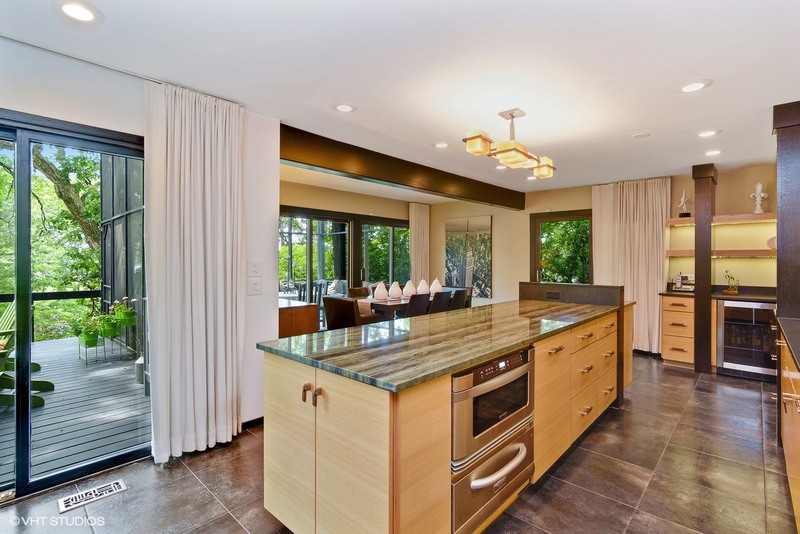 Astute fans of Dennis Blair’s architecture will note that, as in many of his homes, the original galley kitchen was at the front of the home – one of Blair’s trademarks. At the center of it all is the island: Topped with a gorgeous piece of marble from Brazil called Verde Bamboo, it features natural veining that runs in parallel, horizontal lines, finishing off the theme of linearity with striking beauty. 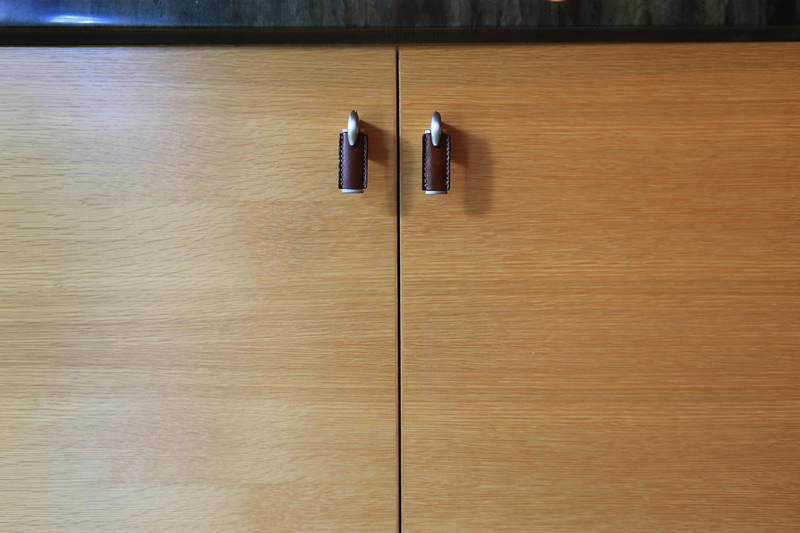 Even the cabinet pulls throughout the kitchen were chosen for their uniqueness and character, being crafted from stainless steel and leather, adding both brightness and yet another natural material that fits so well. 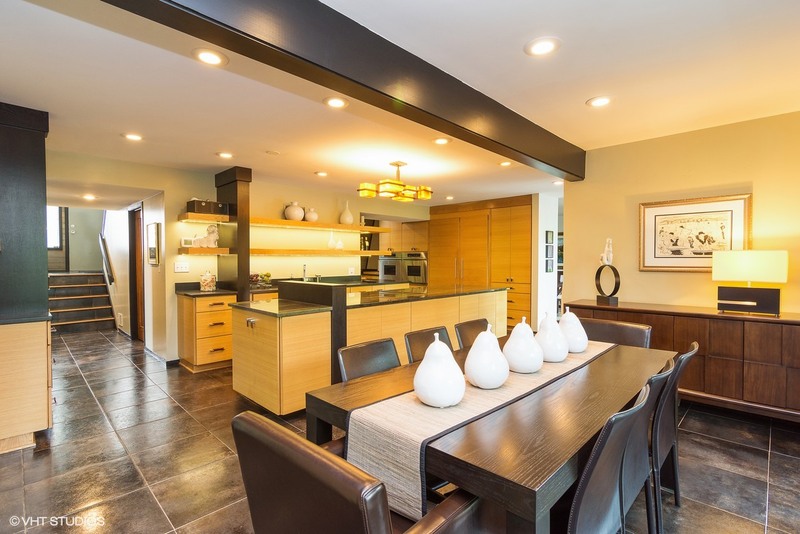 Architectural details, such as the perpendicular wood wall segments on the back counter, island and wine cooler / ice maker area fit in nicely with the home’s thoughtful architecture and design. Since Harry and Jim were making such vast improvements to the kitchen area, they wanted to spruce up the dining room as well. It was in decent shape, but the original built-in cabinetry in that room, and in the nearby powder room, needed attention. 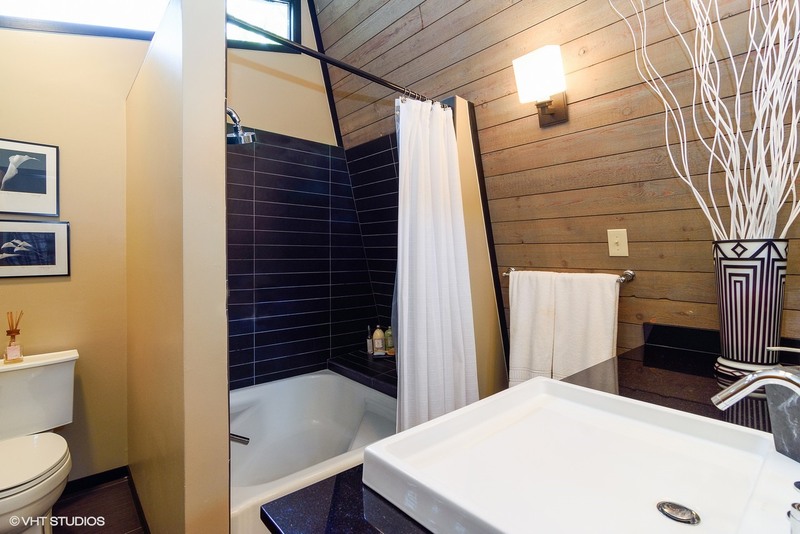 Both of those spaces were restored and updated, as were the two full baths upstairs. 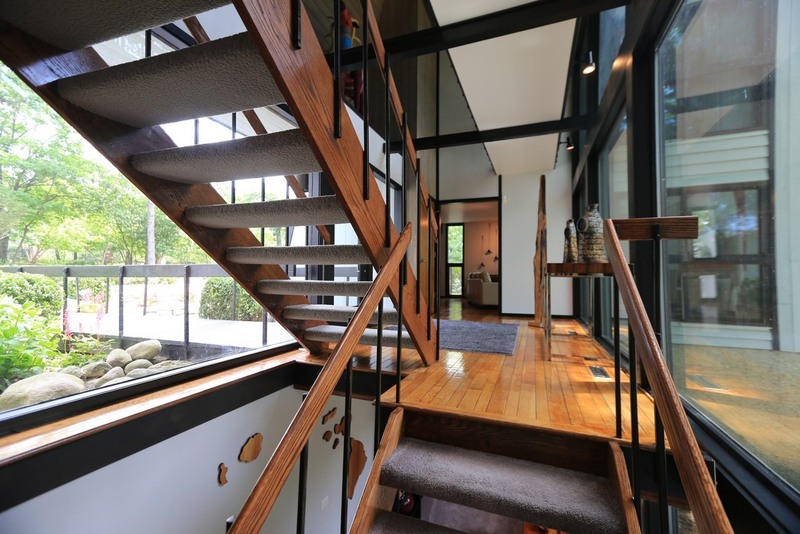 To get to the master suite, you walk up the stairs from the glass entryway, and then go up another few steps to a bridge that overhangs the entryway to the bedroom. 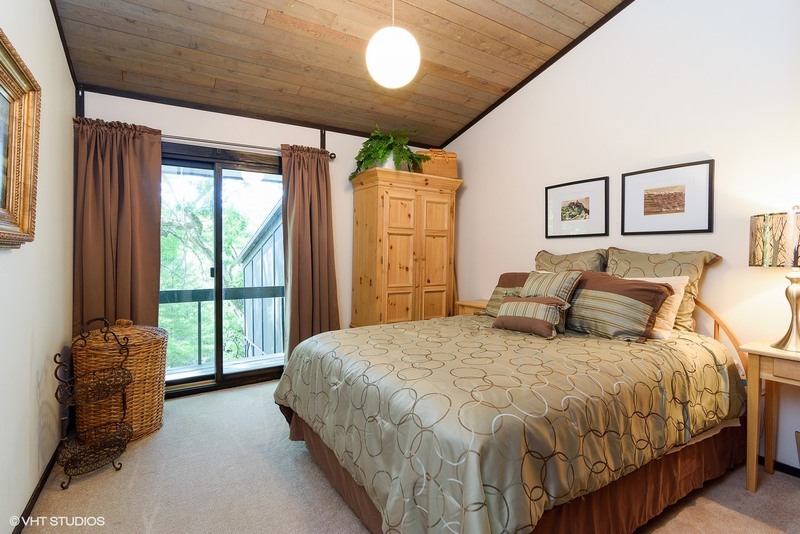 The bedroom is arranged loft-style looking south onto the property, over the living room. 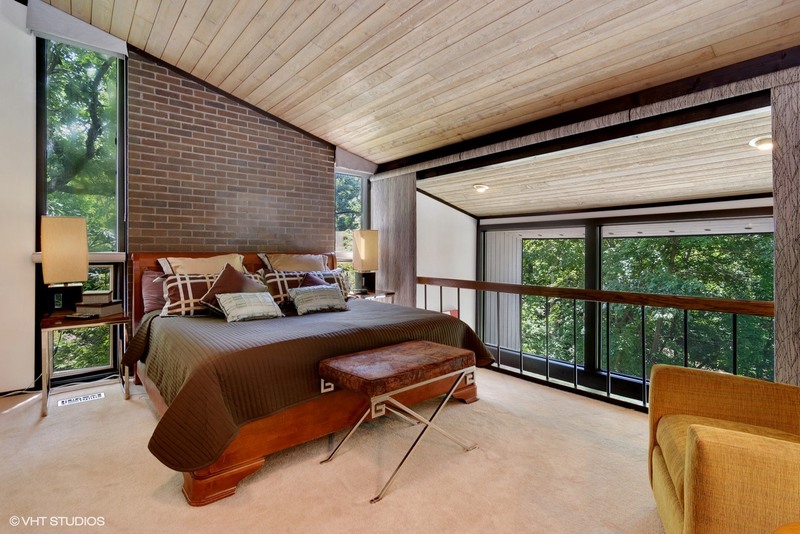 There’s a fireplace in the living room below, and the exposed brick from the chimney forms a sort of natural “headboard” for the bed in the master bedroom, flanked on either side by windows. 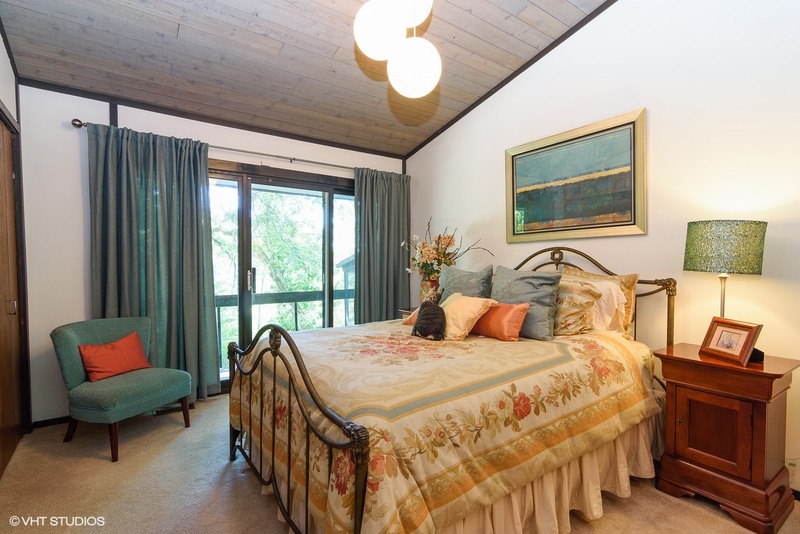 “The arrangement of the master bedroom is one of our favorite things about the house!” says Harry. The master bathroom was dated when Harry and Jim bought the house, as was the second bathroom shared by the other three bedrooms on the 2nd floor. 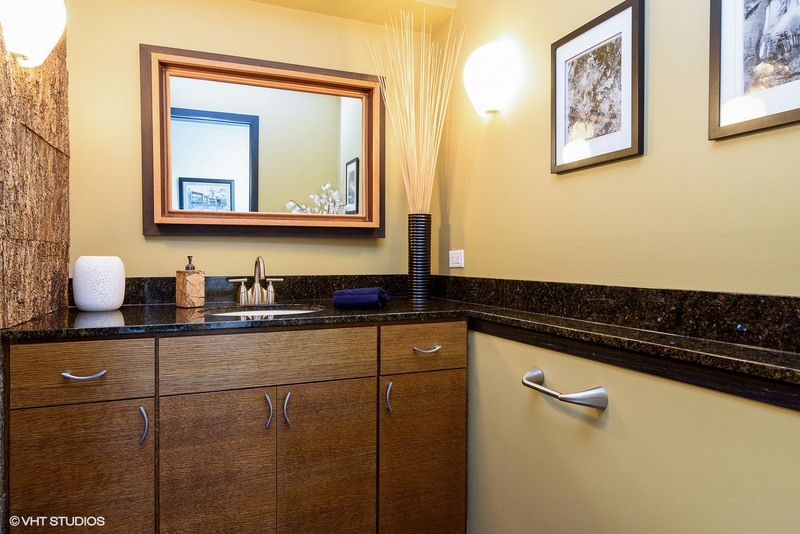 As with the kitchen, when it came time to remodel the two full bathrooms, they wanted to make sure they fit the remodeling to the house. 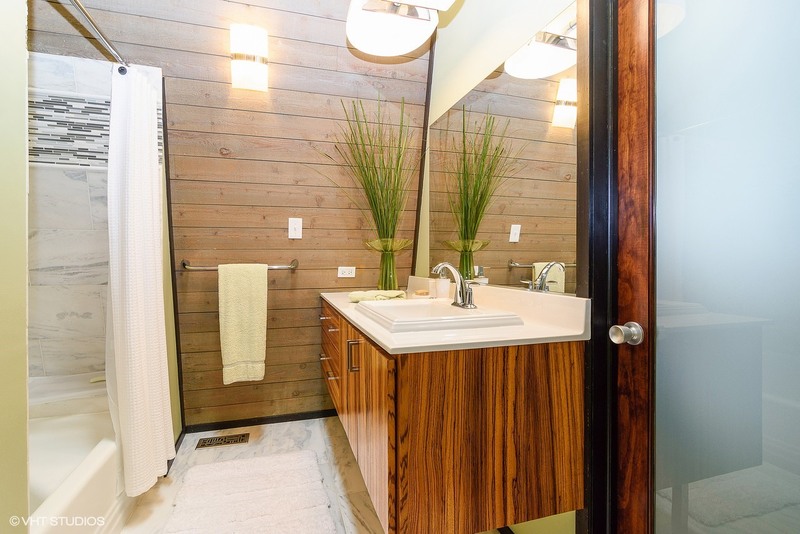 As such, both bathrooms feature cabinetry that angles into the front walls of the house. 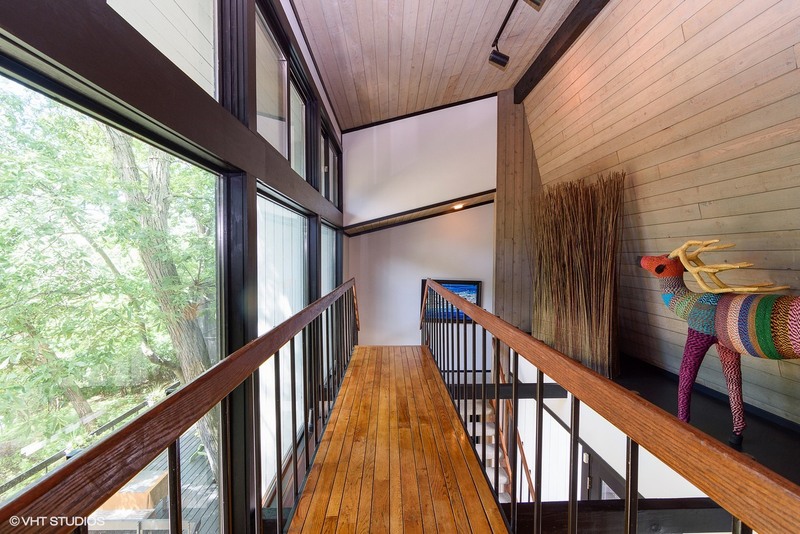 The striking zebra wood cabinets play nicely against the existing cedar in both spaces, again, continuing the practice of updating and improving in character with the home’s original architecture. The addition Jim speaks of is at the west end of the home, and features a two-story layout very similar to the relationship between the living room and the Master Bedroom at the opposite end of the house. 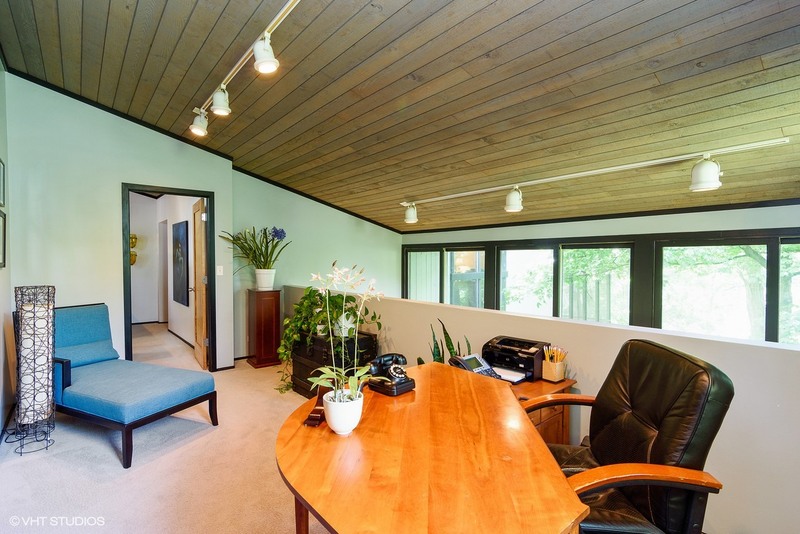 On the main level is the Family Room, and above is the Office. At the back of the Family Room is what used to be the original owner’s darkroom. The Kempers’ addition sits on the north side of the home, at the west end. 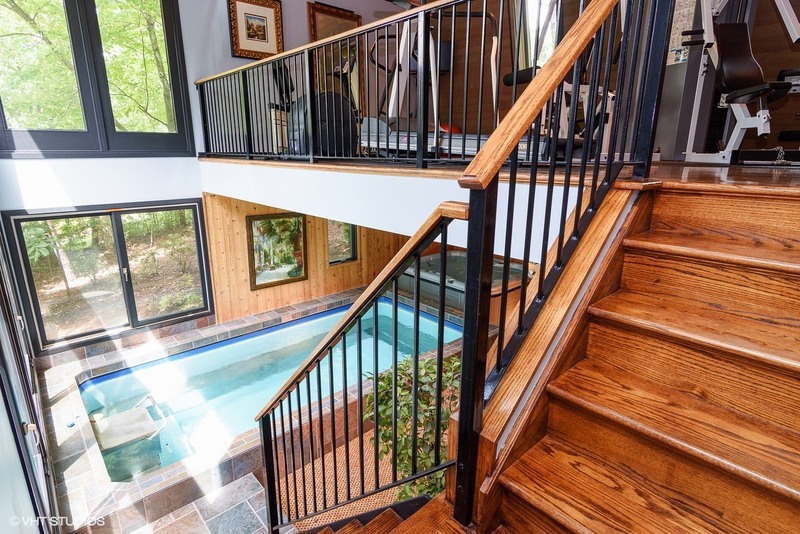 It repeats the lower / upper loft-style arrangement with a ground floor space that includes an endless pool that creates a current to swim against, and a hot tub. 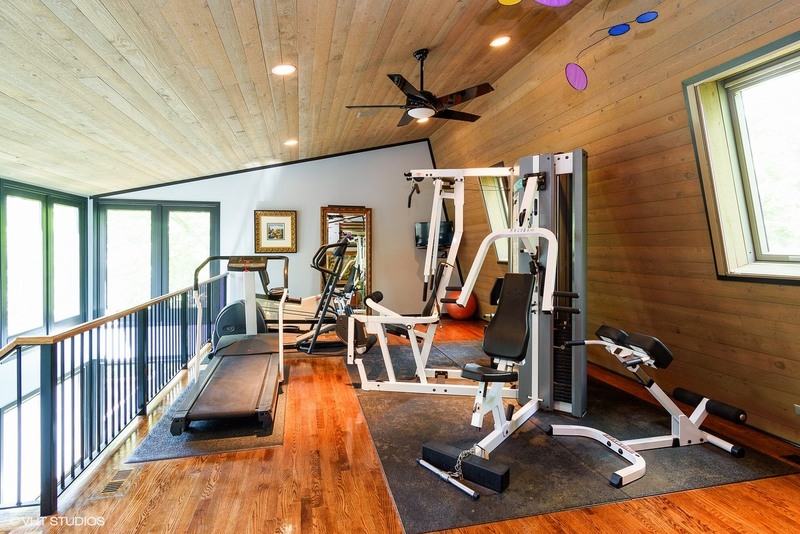 Above is an exercise room with plenty of gym equipment. 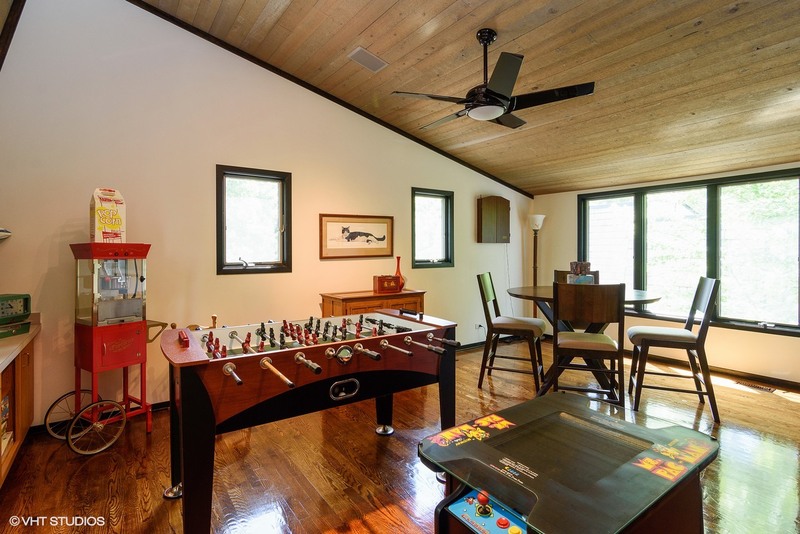 From the exercise room, you pass through a short hallway with a large walk-in closet on the left and a full bath with steam shower on the right, through to the Game Room that Harry and Jim have stocked with all manner of collectibles, games and the like. 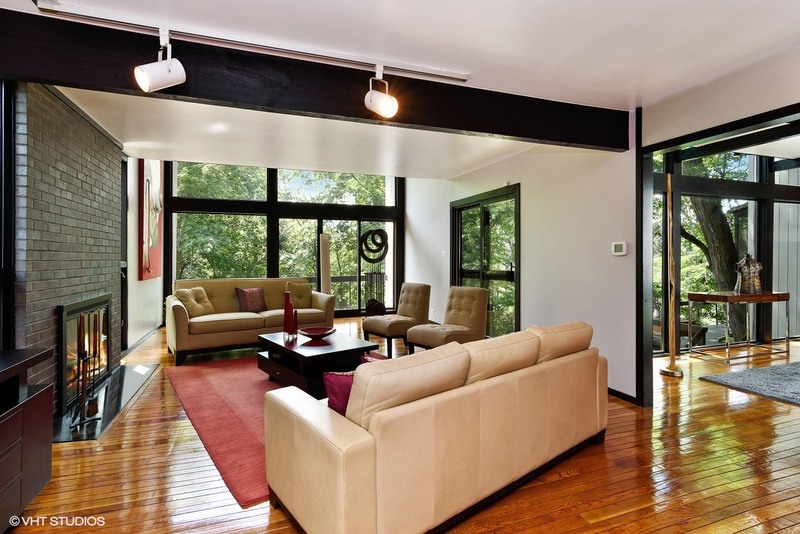 Large windows on the south side give occupants a beautiful view – from another perspective – of the front of the house. Most of the property, however, is behind the house, and that’s where Harry and Jim turned much of their attention once they were finished with the inside of the home. After shoring up much of the landscaping in the back and side yards that included clearing out quite a bit of brush and minor plants, and adding a river rock “creek” for drainage and visual interest, Harry and Jim had a large stone patio created off the rec room below the living room. 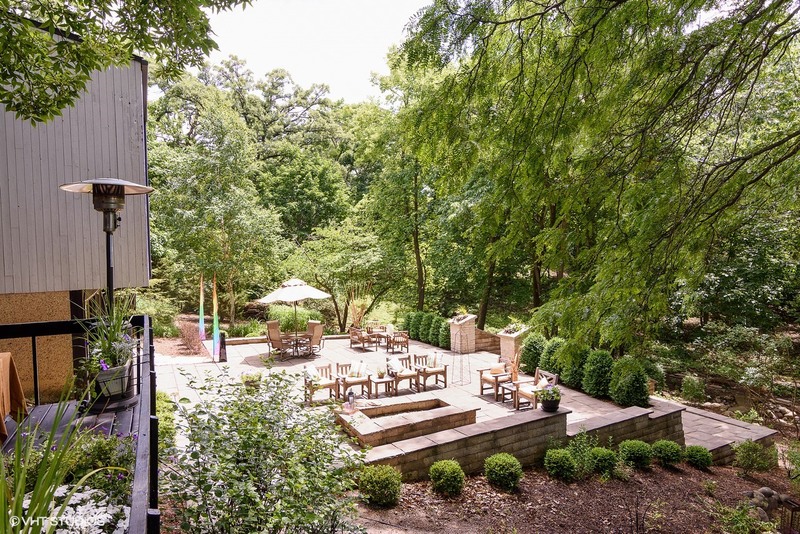 The spacious, 39’ by 24’ patio features several seating areas, and includes a stone fire pit designed to echo some of the home’s angles and architecture. Stone stairs follow the natural slope of the land down to a secondary level. As for Harry and Jim, it’s tough for them to choose a favorite part of the house. At this stage of their lives, Harry and Jim have decided it’s time for them to down-size. Thinking about what’s made the house so enjoyable for them, Harry, too, has a tough time deciding what he’s enjoyed the most. 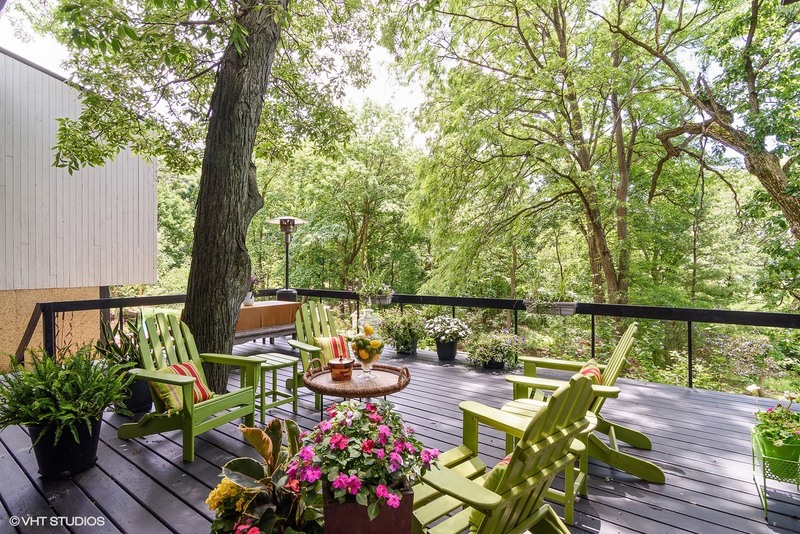 All the love they have for the house, and all of the care they’ve put into it while being the home’s stewards, is apparent in every space – both indoors and out. They’ve made an impressive home and property even better and more enjoyable, which is something that’s neither common or easy. 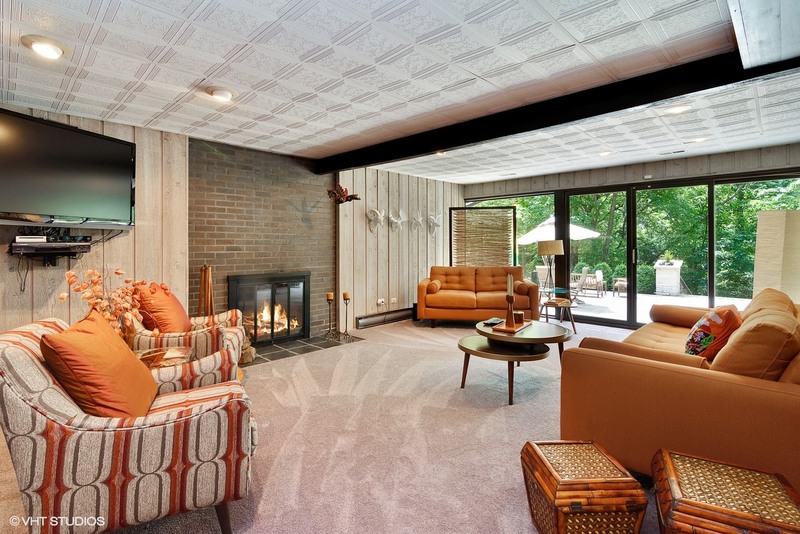 And now this amazing property overlooking Honey Lake in one of North Barrington’s most desirable areas is available for just the third time in its 50+ year history. 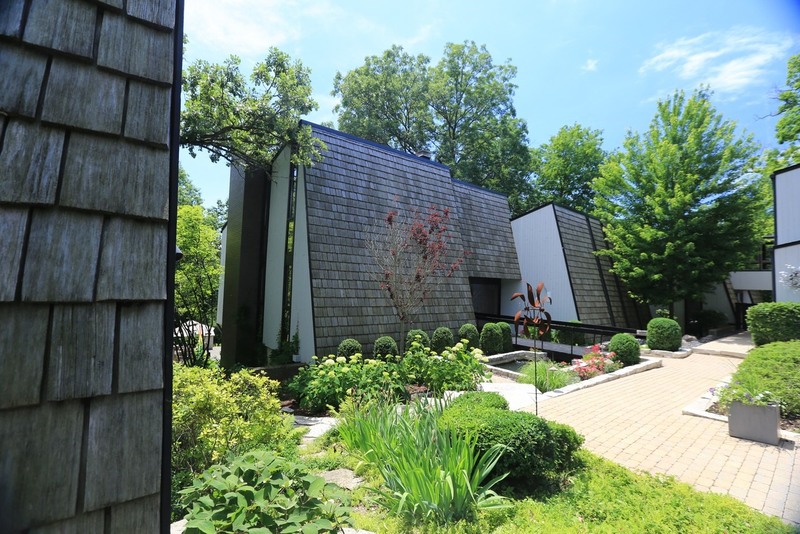 2 Responses to "Spectacular Dennis Blair-Designed “Lake House in the Forest” in North Barrington"
One further comment: my husband was not the photographer. I am. The first addition to the house gave me studio space and a darkroom; the open room above it was his office. Harry and Jim have lovingly enhanced the house. Through these images, our grown children and old friends have been re-living moments from the 22+ years we lived there. Please share this message with Harry and Jim. It is nice to know that they appreciated it as we did. Hi Sandra. Thank you SO much for commenting here! I apologize for getting the details wrong, but I’ve corrected them now. What a wonderful home you had Mr. Blair design for you. I’m very glad that it’s been in such good hands through the years and is now available again, hopefully to another couple or family who will love it and all it has to offer just as you did!